Children are capable of learning the important truths tucked into any of the familiar stories throughout the Old and New Testaments. It's not always easy, however, for kids to grasp the meaning of these truths. It helps to have a reliable and credible resource available to make teaching biblical concepts easier. Fortunately, there's Children's Worship Bulletins. 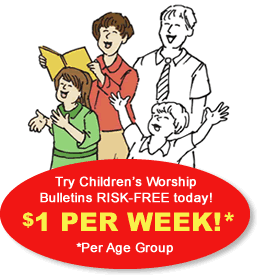 Children's Worship Bulletins are biblically based and educationally sound. The messages in each bulletin are basic, positive and easy to understand. By using Children's Worship Bulletins in your Sunday school class, your lessons can be clear, simple and faithful to the Scriptures. To show you how easy it can be to use Children's Worship Bulletins in your Sunday school class, we have assembled two example Sunday school activities about Samson for you to try. Use one or both, and see for yourself how easy it is to create fun and relevant Sunday school activities with Children's Worship Bulletins. Give each child a bulletin, a pencil, a blank piece of paper and some crayons/colored pencils. Have the children solve the "An angel told Manoah's wife …" puzzle while you read aloud Judges 13:1-24. After reading the story, ask the children to imagine what the angel looked like at the end of the story as he rose unharmed into the flames of Manoah's sacrifice. Have the children draw a picture of what the angel might have looked like as he ascended to heaven unharmed in the flames of Manoah's sacrifice. Sunday school activity about Samson for ages 7-12: What happened next? Give each child an adapted bulletin and a pencil. Have the children complete the puzzle "What happened next?" Allow the children time to complete the puzzle. Then, have a volunteer read the answer. Give each child an adapted storyboard page, a pair of scissors, markers/colored pencils and tape/glue dots. While you read aloud Judges 13:1-24, have the children color the storyboard pictures and cut them out. After reading the story, have the students match the storyboard pictures with their "What happened next?" puzzle solutions and paste them in chronological order onto the bottom of their adapted bulletin. These are just two of the hundreds of bulletins you could create from Children's Worship Bulletins. But we don't stop here. We continue to add new material from the Old Testament, the Gospels and the Epistles to our extensive library, bringing Bible stories to life in each bulletin. In addition, we're adding bulletins that cover special days and holidays to bring you even more choices. All the new material comes with answer keys — many bulletins are even available in color.